The drum throne is the stool in which you sit on. Believe it or not, this is a very crucial part of the drum set. It can sometimes be the difference between a good performance and a poor performance. The throne of a drum set must be adjustable. You should always be able to adjust the height of the throne very quickly and easily. Likewise, the height and settings of the throne must be able to lock in place so there are no unwanted changes. Drum thrones are specifically made for dimmers, so do not try and get away with using any regular stool or chair. There are reasons why these are made and sold. Drumming is a physical instrument to play; one in which comfort must be available. If you are not comfortable, you will play poorly, and face the risk of injury. 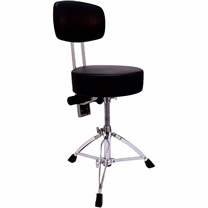 With the right drum stool, you will be forced to sit with better posture and at the right height. Also, the seat will be well padded. This is a much desired feature being that you will be sitting on it for long periods of time. Drum thrones usually run from 40-150$, and can come in all shapes and sizes. Some will even have back rests for support on your posture. The best way is to try out each individual throne and find out which one works best for you!